To facilitate the mobility of heterogeneous networks, control plane (C-plane) and user plane (U-plane) decoupled architecture is being considered by the fifth generation (5G) wireless communication network, in which relatively crucial C-plane is expanded and kept at dependable lower frequency bands to guarantee transmission reliability and the corresponding U-plane is moved to available higher frequency bands to boost capacity. Moreover, we apply this architecture to future professional high-speed railway wireless communication system to fulfill the wireless access desire of train passengers. However, for such emerging architecture, there still exist many problems to be solved to guarantee the reliable transmission. In this article, the problem of how to appropriately evaluate the transmission reliability of C/U-plane decoupled architecture is investigated. Due to the lack of ability to reflect the importance of C-plane, conventional outage probability cannot properly indicate the transmission reliability of C/U-plane decoupled architecture whose primary design consideration is that C-plane more heavily affects the transmission reliability thereby being kept at dependable lower frequency bands. Based on this, a novel indicator named unreliability factor (URF) is proposed. Theoretical analysis and simulation results demonstrate that URF can exactly highlight the effects of C-plane on the entire transmission process. Hence, it is more appropriate to employ URF as the indicator to evaluate the transmission reliability of C/U-plane decoupled architecture. To cater to the exponentially increasing traffic volume requirements in public mobile network, higher frequency bands with wider spectrum are exploited to further extend the capacity of Long-Term Evolution (LTE) network. Unfortunately, compared with lower frequency bands, higher frequency bands suffer from severer propagation loss which seriously limits the coverage. Hence, cells working at higher frequency bands are called small cells. On the account of mobility performance, small cells are usually overlaid on the coverage of macro cells that use lower frequency bands, which forms heterogeneous network. However, as deployment gets increasingly dense, the huge redundant control signaling interaction caused by frequent handovers between small and macro cells reduces the efficiency of heterogeneous networks. In order to mitigate this situation, C/U-plane decoupled architecture is proposed for upcoming 5G wireless communication network [1, 2]. 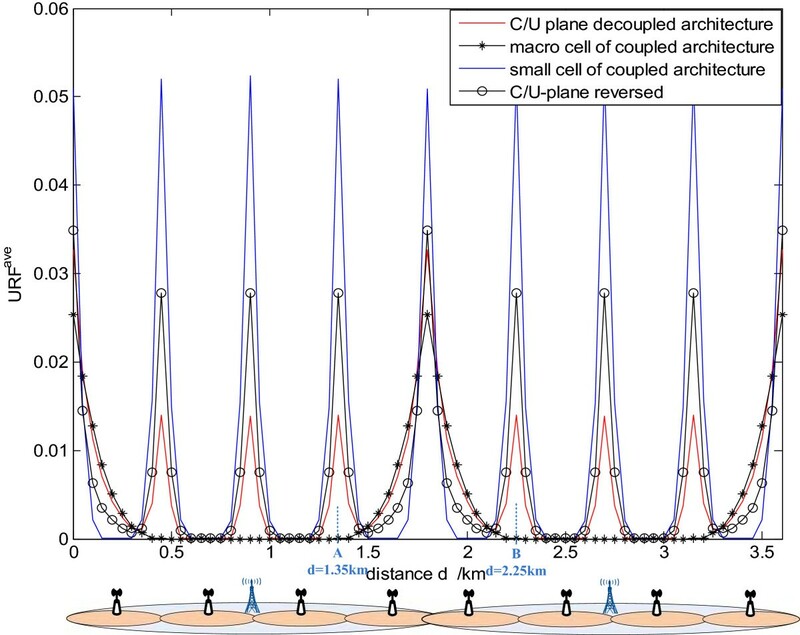 In this architecture, the relatively important C-plane is extended and kept at lower frequency bands of macro cells. In addition, the main capacity demander U-plane is moved to the small cells using available higher frequency bands with wider spectrum. With considerable coverage of macro cells, much fewer handovers happen to the C-plane compared to conventional coupled architecture of heterogeneous networks. Therefore, under a macro cell, the handover process is just simplified to the U-plane handover, which saves lots of control signaling interaction. With the remarkable success of railway industry and wireless technologies, train passengers are eager to enjoy the Internet during long-distance journey. However, existing narrowband GSM-R (Global System for Mobile Communication for Railway) which is originally designed to transmit low-volume train control information cannot afford this huge capacity. In order to provide broadband services for train passengers, railway wireless communication system is confronting the evolution to its next generation. With enhanced robustness, LTE is the most potential one for the evolution [3, 4]. Based on this, in our previous work [5, 6], we applied C/U-plane decoupled architecture to future professional high-speed railway wireless communication system to fulfill the wireless access desire of train passengers and the network architecture is depicted in Figure 1. With consideration of the return on investment, no public mobile network operator would like to offer a thorough coverage for most sparsely populated railway scenarios. Nevertheless, in the C/U-plane decoupled railway wireless network, both train control information and passengers’ services can be transmitted. This provides a better choice for passengers to get a higher-quality service. Furthermore, on account of the severe challenges faced by high-speed railway scenario such as large penetration loss and group handover, it is difficult for passengers inside the train to hold a dependable connection with outside base station directly. Hence, as shown in Figure 1, mobile relay (MR) and access point (AP), which are connected with each other via optical fiber, are separately mounted on the roofs outside and inside the train . This also provides a potential way to save operators’ infrastructure cost by converging different air interface technologies (e.g., LTE/3G/2G/Wi-Fi) on the AP and employing LTE on the link between MR and the outside base stations. Inside the train, passengers connect to the AP and then their data are forwarded to outside base stations via MR. In the C/U-plane decoupled architecture, C-plane signaling and U-plane data of train passengers’ services are separately transmitted by the macro and small cells. The macro cell employs lower frequency bands to provide good connectivity and mobility of C-plane and the small cell works at available higher frequency bands to expand capacity. On account of transmission reliability, crucial train control information is entirely kept at lower frequency bands without decoupling. As a result, train control information and data of passengers are separately transmitted through different nodes. In this way, the artificial interference from the passengers is avoided, thereby enhancing the security to some extent. However, this is already out of the scope of our study. In addition, this article focuses on the effect of decoupled C/U-plane on the transmission reliability of passengers’ services. 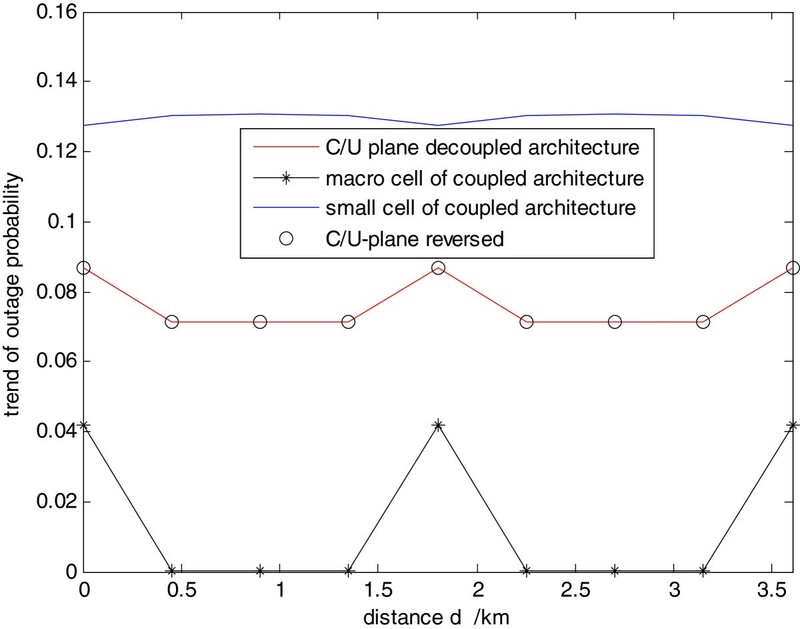 C/U-plane decoupled architecture in high-speed railway. For clarity, the booming LTE network is employed as the benchmark system for following analysis. In LTE network, C-plane is responsible for essential control operations such as broadcasting system information, network attaches, paging,and mobility management . Moreover, the functionality of U-plane is to forward user data flow. Definitely, without a reliable C-plane, the U-plane cannot work properly. From the perspective of air interfaces, without reliably transmitted Physical Downlink Control Channel (PDCCH) that accommodates control information to indicate ‘who’ the data are for, ‘what’ data are sent, and ‘how’ the data are sent on Physical Downlink Shared Channel (PDSCH), the user data cannot be correctly decoded. Considering the above mentioned in [9, 10], the crucial C-plane instead of U-plane is kept at dependable lower frequency bands so that the transmission reliability of C/U-plane decoupled architecture could be well guaranteed. However, the performance evaluation of this architecture has not been well studied. Actually, for such emerging network architecture, there still exist many problems to be solved to guarantee the reliable transmission. For instance, Doppler effect is always a severe challenge for high-speed railway scenario. While in the C/U-plane decoupled architecture, C-plane and U-plane of the same user are transmitted at different frequencies thereby facing different Doppler shifts and Doppler spreads. Hence, the Doppler effect may get even worse. Fortunately, railways are mostly built in wide suburban or viaduct environment where multi-paths can be neglected and the wireless channel can be regarded as LOS . Thus, there almost exists no Doppler spread in high-speed railway scenario. According to [4, 6], with a known train’s location and velocity supplied by the communication-based train control (CBTC) system, it can be assumed that Doppler shifts are separately compensated for C-plane and U-plane. Hence, how to appropriately evaluate the transmission reliability of this decoupled architecture becomes an urgent problem, which will greatly impact subsequent research directions on performance enhancement. In wireless networks, the outage probability defined as the probability that the received signal quality is lower than some threshold is a popularly used indicator to reflect the transmission reliability [11, 12]. Under this definition, the outage probability of C/U-plane decoupled architecture can be expressed as the complementary probability of an event that both signal qualities of C-plane and U-plane are larger than the outage threshold. Obviously, from the view of air interface reliability, the effects of C-plane and U-plane on outage probability are virtually equal. That is to say, due to the lack of ability to reflect the importance of C-plane, the conventional outage probability cannot properly indicate the transmission reliability of C/U-plane decoupled architecture whose primary design consideration is that C-plane more heavily affects the transmission reliability thereby being kept at dependable lower frequency bands. To facilitate the presentation, except for special behaviors such as paging and handover, we only take the general communication process as an example to qualitatively analyze the reliability relationship between C-plane and U-plane. In terms of theoretical analysis based on signal quality of air interface, the analysis procedures and results of uplink and downlink are the same. Hence, for simplicity, the following analysis is just on the basis of downlink. In the general communication process of C/U-plane decoupled architecture, PDSCH served by the small cell carries user date and PDCCH provided by the macro transmits corresponding control information such as transmission format to help receiver correctly decode the data on PDSCH. For PDCCH, its symbol error rate (SER) is directly caused by its poorly received signal quality. Nevertheless, these errors of PDCCH will badly affect the decoding correctness of data on PDSCH . As a consequence for PDSCH, its errors result from two aspects, some of which are caused by its own poor signal quality and others are induced from the errors of PDCCH. In practice, if SER of PDCCH exceeds some threshold, then no matter how well the signal quality of PDSCH is, the receiver cannot correctly decode the data on PDSCH. Based on this, a more appropriate indicator named unreliability factor (URF) which can highlight the importance of C-plane is proposed to evaluate the transmission reliability of C/U-plane decoupled architecture. The rest of this article is arranged as follows. ‘Radio propagation model’ section gives the propagation model for C/U-plane decoupled architecture. ‘System outage probability of C/U-plane decoupled architecture’ section proves that conventional outage probability cannot properly indicate the transmission reliability of this architecture. ‘System reliability-based reliability evaluation method’ section describes the proposed indicator URF and its appropriateness in evaluating the transmission reliability of this architecture. Finally, ‘Conclusions’ section concludes the whole article. Since the communication system in high-speed railway scenario has a linear topology, the macro and small cells of C/U-plane decoupled architecture are deployed on a straight line with vertical distance of D to the rail as shown in Figure 2. Suppose the base stations’ radiation is omnidirectional, and the coverage radiuses of macro and small cell are RC and RU respectively. Besides, the abscissa axis coinciding with the driving direction is set to facilitate the expression of train travel distance d. Without loss of generality, two macro cells are considered in the following analysis, i.e., the analysis scope of d is from 0 to 4 RC- 2aC, where aC is the overlapping area distance of two macro cells and as shown in Figure 2, the overlapping area distance of two small cells is denoted by aU. where ⌊·⌋ denotes rounding down operation. where NeNB represents the number of co-channel eNodeBs. For clarity, subscripts of parameters that relate to C-plane are set to C. And for U-plane they are set to U. However, in fact Pt, PL(x), ε, and I are determined by current serving base station while not the plane, that is, Pt,C, PLC(x), εC and IC are the properties of the macro cell which serves the C-plane. With subscript U, they are the properties of the small cell which provides U-plane. The above also applies to the following expressions. Shadow fading is a large-scale phenomenon which depends on the surrounding communication environment. 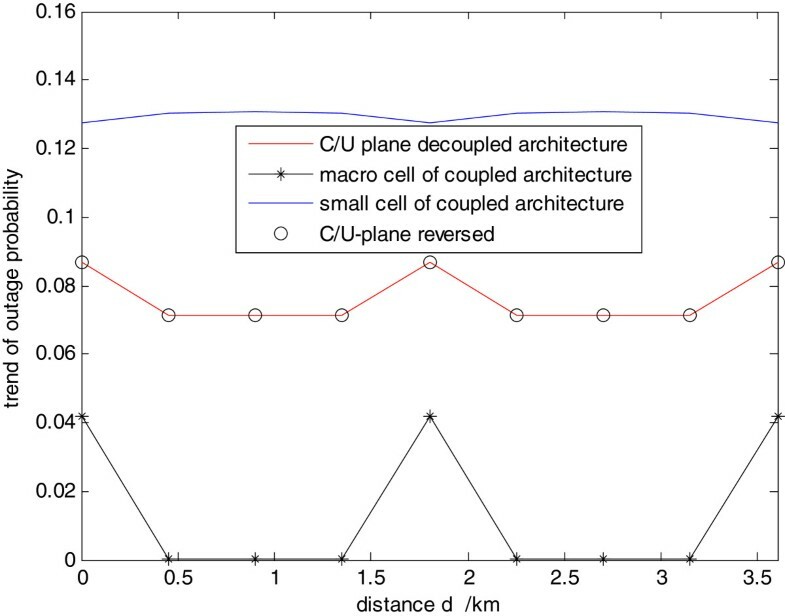 Although in C/U-plane decoupled architecture the macro and small cell are deployed at different locations, they simultaneously serve the same train user. 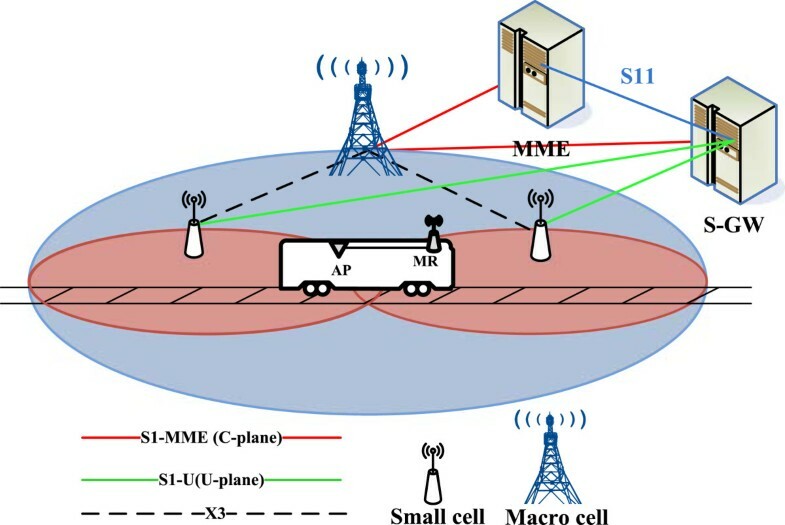 Hence, there exist some common components between the propagation paths of macro cell and small cell signals, especially for the area near the train. As a consequence, the shadow fading of macro and small cells are cross-correlated. Based on [15, 16], cross-correlation of shadow fading can be explained by a partial overlap of the large-scale propagation medium as shown in Figure 3, and non-overlapping propagation areas are considered independent. Then, substitute (12) into (9), ρ(C,U) is obtained, with which the standard variances, a(d), b(d), and C(d) in (8) can be worked out. Based on the above modeling, a numerical simulation is conducted and the results are shown in Figures 4 and 5, where Figure 4 depicts the outage probabilities of different network architectures and Figure 5 corresponds to the trend in Figure 4. Detailed simulation parameters are listed in Table 1. Reliability evaluation under conventional outage probability. From the above theoretical analysis and simulation, it is easy to find that in terms of the air interface reliability, the effects of C-plane and U-plane on outage probability are virtually equal. 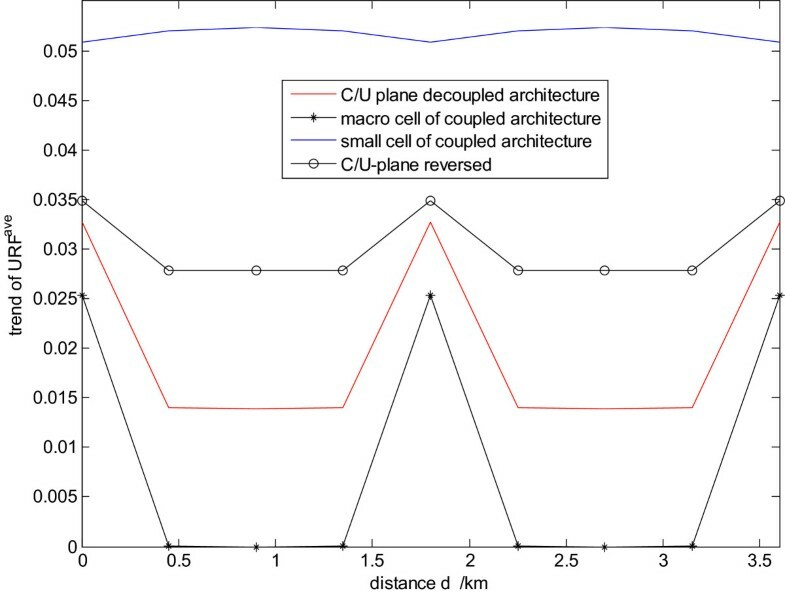 As shown in Figures 4 and 5, the transmission performance of C/U-plane decoupled architecture is just the averaging of that of coupled macro cell and small cell architectures. For instance, at the scope (A, B), although C-plane cannot be reliably transmitted, the entire system performance of C/U-plane decoupled architecture is not so poor. While at the center of macro cell, no matter how reliably C-plane performs, the entire transmission reliability of C/U-plane decoupled architecture is badly affected by the poor U-plane. Besides, if C-plane and U-plane are reversed, i.e., U-plane is kept at macro cell and C-plane is moved to small cell, the result of outage probability has not changed. This thoroughly reveals that the conventional system outage probability cannot convey the primary design consideration of C/U-plane decoupled architecture that C-plane more heavily affects transmission reliability than U-plane thereby being kept at dependable lower frequency bands. Hence, it is not proper to employ simple outage probability as the indicator to evaluate the transmission reliability of this decoupled architecture. Trends of outage probability in Figure 4 . Reliability relationship between C-plane and U-plane. where α function is supposed to be monotone increasing with definition field of SERC from 0 to 1 and range of SERU/C from 0 to 1 as well. 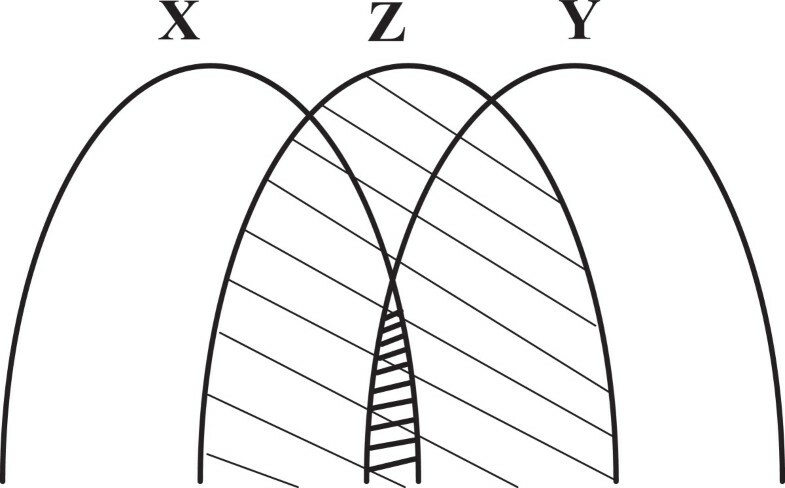 However, the exact expression of α function depends on the system settings and is out of our study scope. It is obvious that URF has the ability to reflect the importance of C-plane. When the SER of crucial C-plane is beyond the threshold thC, in spite of the transmission performance of PDSCH, URF is directly set to 1. This exactly conforms to the previous analysis result that if SER of PDCCH exceeds some tolerable value, then no matter how well the signal quality of PDSCH is, the data cannot be correctly received. While if C-plane is reliably transmitted, the value of URF will depend on the SER outage probability of PDSCH which is defined as the probability that the SER is higher than some threshold . Practically, the SER outage probability of PDSCH is much lower than 1. Hence, at the point of SERC=thC, URF is not rightly continuous thereby not a probability function. As a matter of fact, URF can be interpreted as a kind of indicator, which equals to a complex and reasonable probability value. where Q−1 is the inverse function of Q function, and C(xC(d)) is defined to simplify the following expressions. where U(xU(d)) is defined to simplify the following expressions. On the basis of above theoretical analysis, numerical simulation is performed as shown in Figures 8 and 9. The simulation parameters are set as in Table 1. From Figure 8, at the scope (A, B), the entire performance of C/U-plane decoupled architecture is badly degraded by the poor transmission of C-plane, which just like that of coupled macro cell architecture. 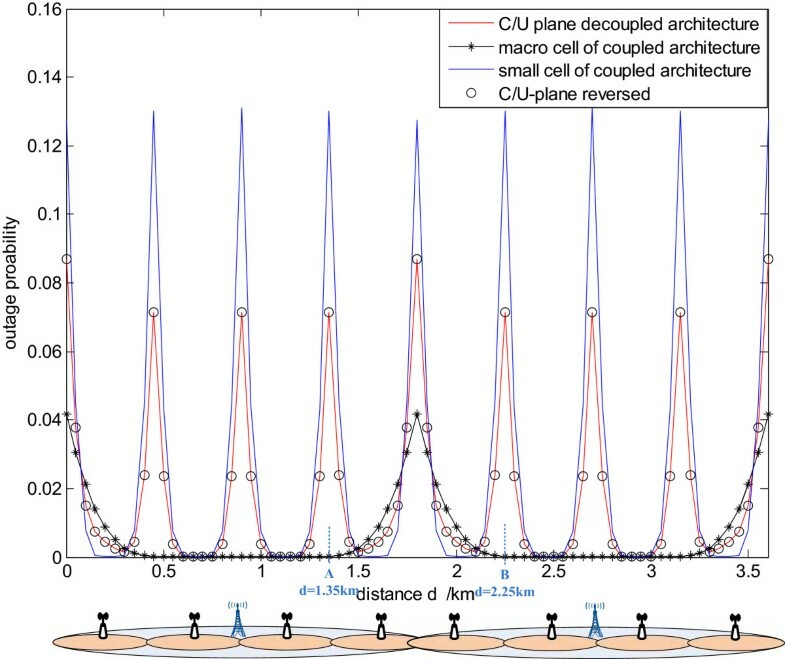 While at the center of macro cell, thanks to the well-transmitted C-plane, the entire performance of C/U-plane decoupled architecture is not so badly affected by the poor U-plane. Besides, for the reversed case that C-plane is moved to small cell and U-plane is kept at macro cell, the entire performance gets absolutely different. For example, at the scope (A, B) the reversed C/U-plane decoupled architecture performs better. But in most situations, it possesses much poorer transmission reliability than normal C/U-plane decoupled architecture. From the trend of URF in Figure 9, it is also obvious that normal C/U-plane decoupled architecture can provide more reliable transmission than the reversed case, which exactly conforms to the consideration during the design of C/U-plane decoupled architecture that C-plane more heavily affects the transmission reliability than U-plane thereby being kept at dependable lower frequency bands. Therefore, under the proposed indicator URF, the importance of C-plane is completely reflected and it is more proper to use URF as the indicator to evaluate the transmission reliability of C/U-plane decoupled architecture. URF ave of different network architectures. Trends of URF ave in Figure 8 . For upcoming 5G wireless communication system, C/U-plane decoupled architecture is a potential way to not only expand capacity but also to prevent unnecessary control signaling overhead. In addition, we apply this architecture to future professional high-speed railway wireless communication system to fulfill the wireless access desire of train passengers during long-distance journey. However, how to properly evaluate the system transmission reliability of C/U-plane decoupled architecture becomes an urgent problem, which will impact the subsequent research direction on performance enhancement. It has been proved that the conventional outage probability cannot convey the primary design consideration of this decoupled architecture that C-plane more heavily affects the entire transmission reliability than U-plane thereby being kept at lower frequency bands. Based on this, a novel indicator URF is proposed. The theoretical analysis and numerical simulation results have confirmed that URF performs more properly in evaluating the entire system transmission reliability of C/U-plane decoupled architecture. Li Yan and Xuming Fang contributed equally to this work. The work of the authors was supported partially by the 973 Program under Grant 2012CB316100, NSFC under Grant 61032002, and the Program for Development of Science and Technology of China Railway Corporation under Grant 2013X016-A.